Flora Creek Hotel Apartments Dubai - Dubai Hotel Located in Dubai City Centre, Dubai Shopping Area and Dubai Business District! 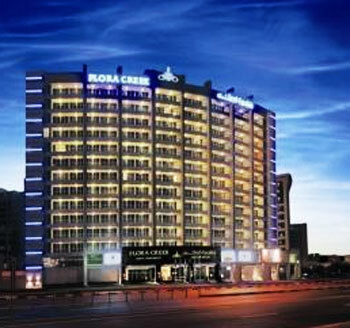 Flora Hotel offers spacious self-contained apartments in Dubai Creek, 2 km from Dubai International Airport. It features an elegant spa and wellness centre and an outdoor swimming pool. All apartments at Flora Creek Deluxe Hotel have modern furniture and flat-screen satellite TVs with DVD players. In addition, every apartment features a fully equipped kitchen, a separate living room and free Wi-Fi access. Guests of Flora Creek Deluxe Hotel Apartments can enjoy Mediterranean, Arabic and Asian dishes at the Ambrosia Restaurant. The Sugar and Spice Coffee Lounge offers an assortment of beverages and light snacks in a relaxing environment. The well-equipped gym at Flora Park Deluxe includes a jacuzzi, steam bath and sauna facilities. The hotel also has an outdoor pool with a sun terrace, and Dubai Golf Club is less than 1 km away. Free airport shuttles are available to Dubai International Airport, Jumeirah Beach and Dubai Mall. Private on-site car parking is free.